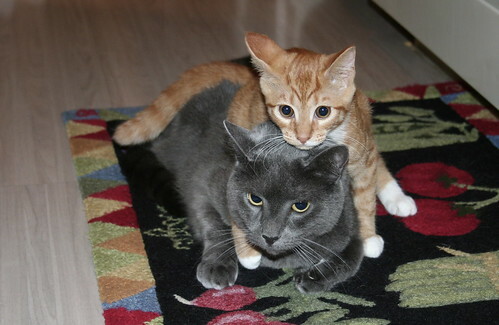 kitten — Writing… or Typing? "You keep using that word. I do not think it means what you think it means. " In other breaking news, up is still up. Down still down. Ignorance is not strength. 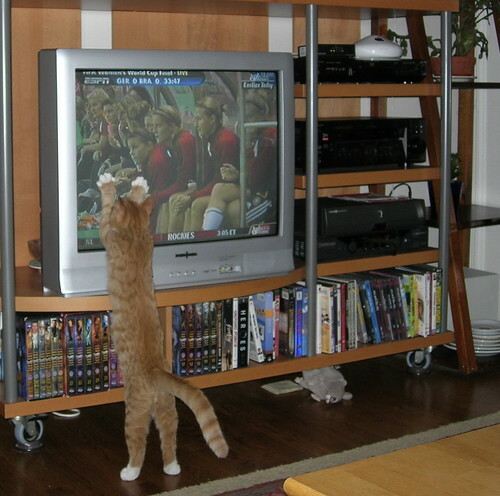 Film at eleven. Who am I to deny Mel? 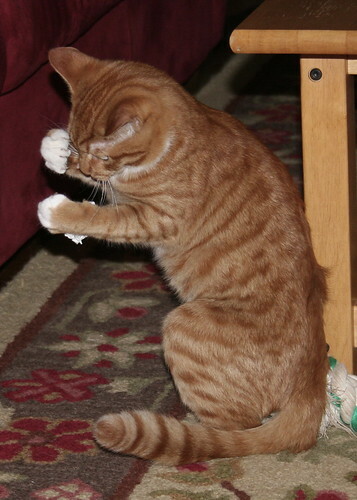 (Juggling said paper-ball toy. Seriously, this cat has enough toys to stock a big-box pet store. 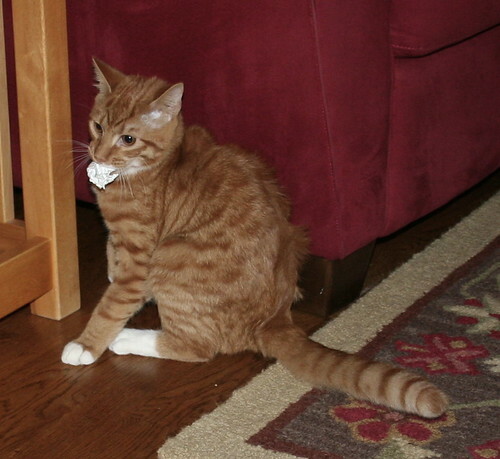 But his favorite toy is a crumpled receipt). 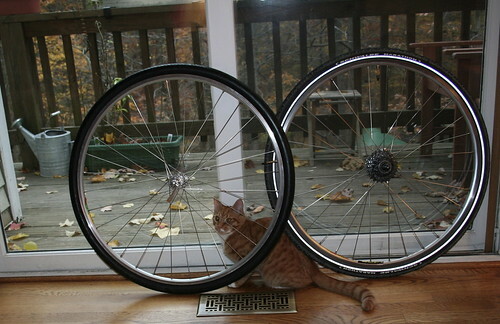 (Playing Prisoner of Zenda with John’s new bicycle wheels). Crossing as many fingers and toes as would still allow us to get on with normal human activities in order to mystically help the Red Sox? Check. 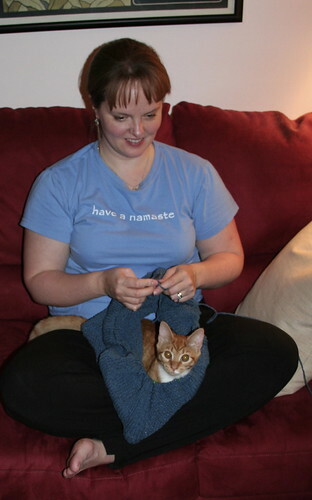 Hauling out sweaters with glee as the weather is finally chilly? Check. Making more of them? Check. 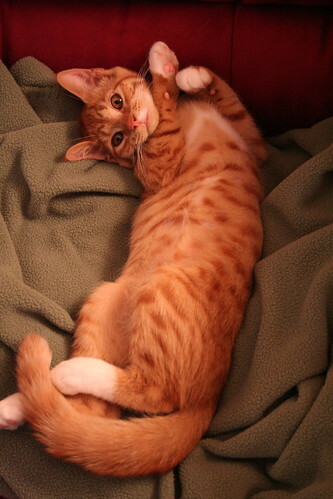 Gratuitous cute cat photos featuring Milo in unlikely poses? Check. 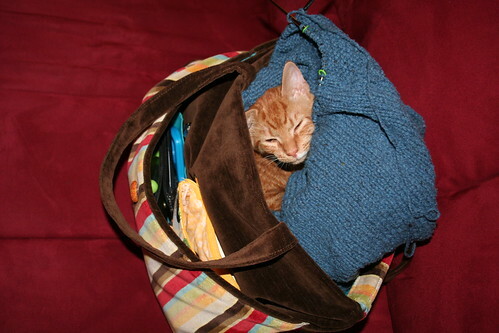 Filed Under: daily life Tagged With: daily life, kitten, knitting, milo, sports? really? I’m just hoping yesterday’s mental peregrinations made sense to somebody. Because I’m not completely heartless, I shall give you a long-awaited glimpse of that superstar of the animal kingdom, Monsieur Milo leChat. His covetous approach towards my Sea Silk stole was not a one-off, it appears. 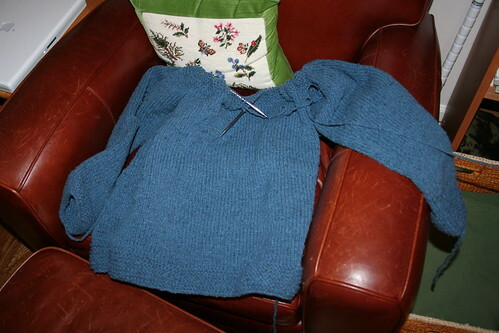 The current project, John’s “Cobblestone” sweater from the latest IK is also a prime favorite with him (is it the color? Does he just like blue? It is a nice shade for a redhead). 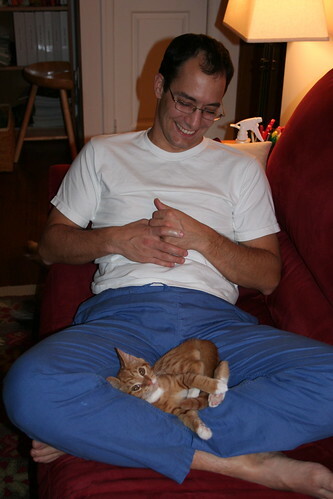 John often terms him a “funny little creature,” and this is very true. 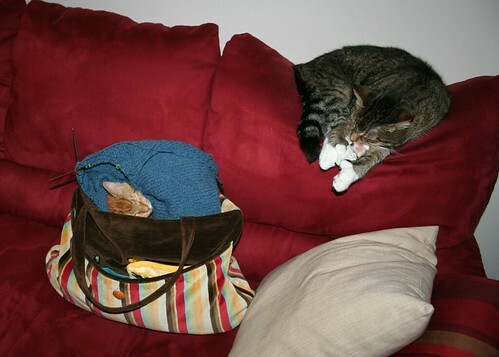 He has a very un-cat-like willingness to be moved about – so much so, that when he curled up in the sweater-in-progress and I needed to be elsewhere, he didn’t object when I bundled up project and cat and deposited the whole shebang in the knitting bag. 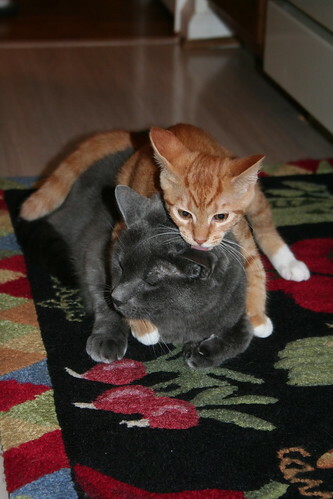 (yes, he’s still wee, our Milo). 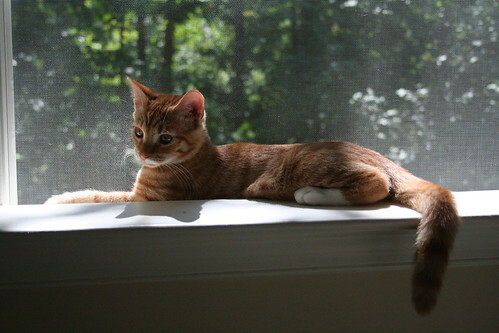 Oi, Milo – you make a better door than a window, fella! 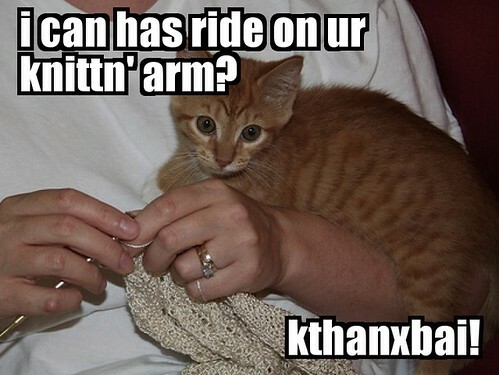 Warning: Cat AND Knitting Content Below. 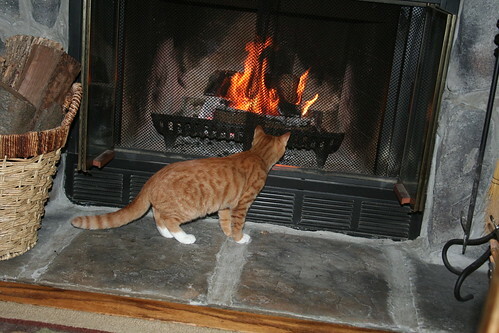 Milo continues his streak as a wee charmer. 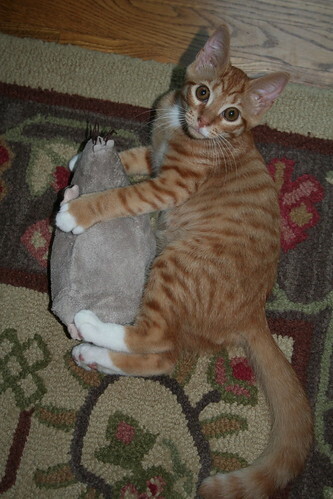 He’s cuddly as all get out, has an endearing “squeak” instead of a meow, and keeps us laughing with his playful antics. 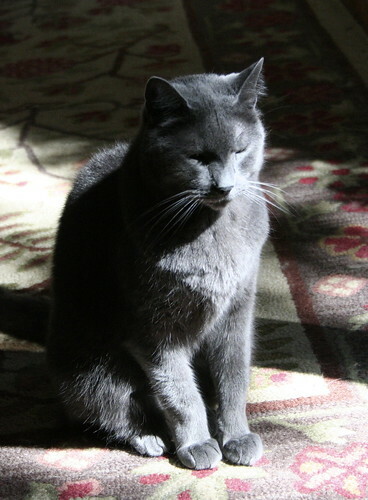 All around, a good cat. We’ll keep him. 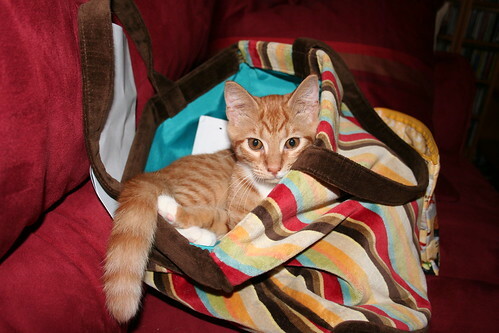 He also (so far) is more interested in lounging in knitting bags than grabbing yarn with teeth and claws. I consider this a good thing. Last night, he brought his cuddliness to a whole new level, though. 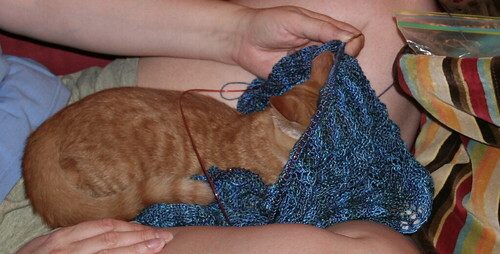 As I sat knitting the edging on to my “Print o’ the Wave” stole, he decided to investigate. 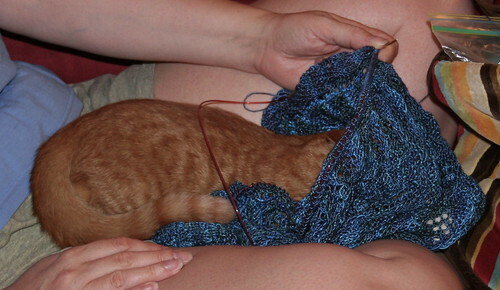 At this rate, I’m NEVER going to finish the edging! 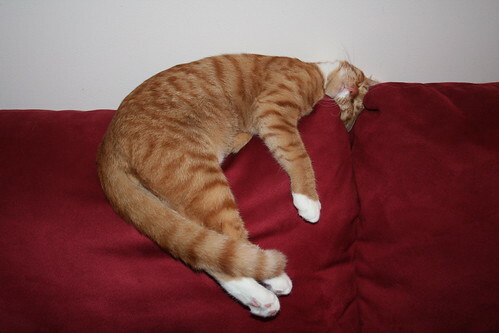 Milo had his first rabies shot on Friday, so spent yesterday feeling low. 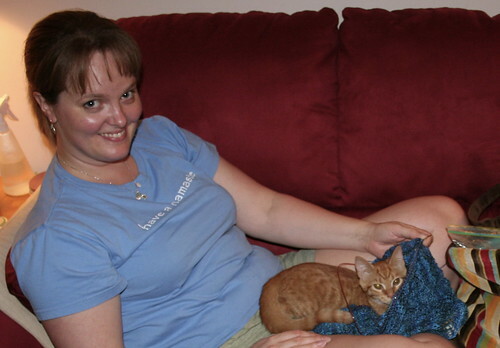 He didn’t want to be held, didn’t want to be on laps, didn’t want to eat very much. He seemed to feel like he had flu – occasional feints at normal activity, followed swiftly by relapses into glassy-eyed apathy. Ratty – would you care to dance? Stop me before I macro again. 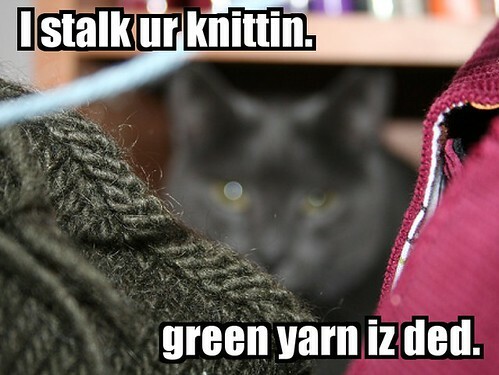 There’s a group on Ravelry that has devoted itself to lolcat macros (of course there is – let’s not even pretend to be surprised, shall we?). 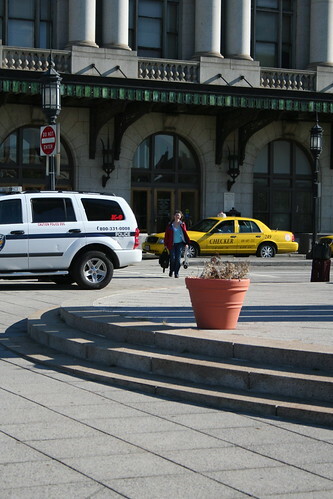 For some reason, this has gotten me digging into the flickr files. And then, I have to share with you. 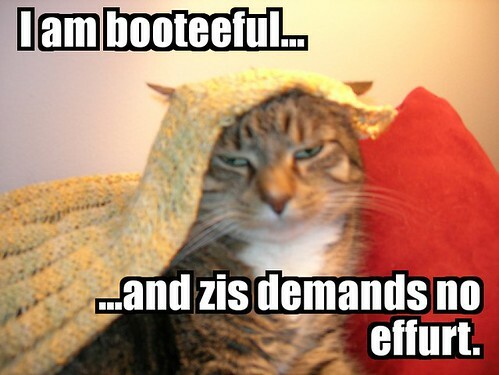 It’s a bad cycle, but I am helpless in the lolcat thrall. …but we can’t forget the dog, can we? 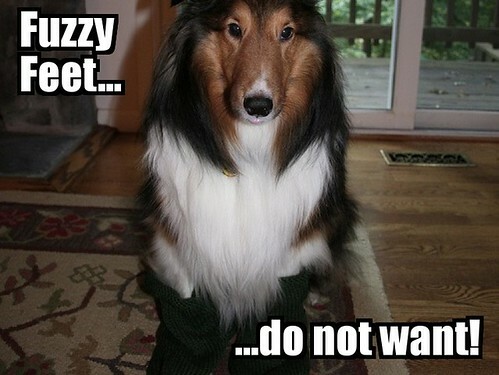 I promise not to inflict these on you again. Kthanxbai. You know my human mommy has been running for about two months, right? Well, she says she’s not in training for anything, but she is going to be doing the 2007 AIDS Walk in Washington. She’s getting pretty close to her fundraising goal, but she’s not quite there yet (and if I know her, she probably wants to exceed that goal, not just meet it). Whatever works. We’re all in this together, right?